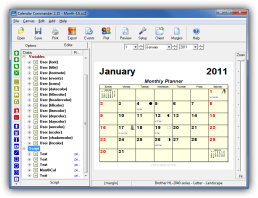 Calendar Commander ™ is a versatile calendar printing program for Windows. Customize and print any of the many ready-to-use calendars included or design your own from scratch using the built-in editor. Include your own photos to make attractive wall calendars for yourself or as gifts for friends and family. 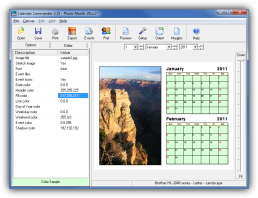 Calendar Commander has extensive support for printing personal events and holidays. Over 3 dozen calendars are ready to use in yearly, monthly, weekly, and daily formats. Exe format (cctrial.exe, 3.1 MB). Download and run to start the installation. Zip format (cctrial231.zip, 3.1 MB). Setup file wrapped in a zip file. 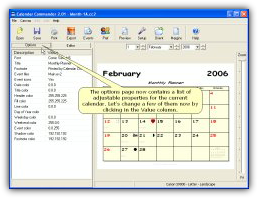 The CCConvert.exe utility program is provided to insert the new properties introduced in version 2.20 into calendar files created by previous versions. 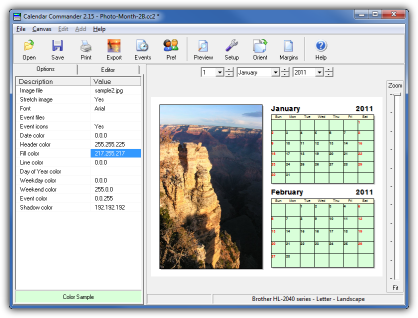 Order the full licensed version of Calendar Commander for $34.95 from the Order Form page. Multi-user site licenses are also available. Version 1 license holders can contact Kent Briggs for instructions on how to upgrade to version 2 at 50% off the regular price. 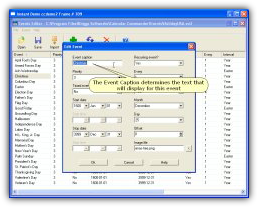 Event Converter 1.00 - Use the EConvert.exe (325 K) utility to convert your version 1 event files (.ev1) to version 2 event files (.ev2). Frequently Asked Questions - A FAQ file for Calendar Commander is available here.